($11.99 each for a purchase of 5 or more). ($19.99 each for a purchase of 5 or more). tv show at the age of 28. In this show Johnny does a game show spoof and also shows the correct way to prepare a Thanksgiving dinner with hilarious results. BLONDIE "The Gun Collector" (1953) The popular comic strip came to tv in the early 1950's. In this episode Mr. Dithers sends Dagwood to buy a one of a kind pistol for him and Blondie thinks that Dagwood wants it for himself. DAY IN THE LIFE OF DENNIS DAY "Pilot" (1951) In this kinescope Dennis Day's girlfriend's parents can't figure out what makes Dennis act so dumb. They think that it's because he has amnesia and is actually a missing millionaire. MY LITTLE MARGIE "Go West Young Girl" (1952) Stars Gale Storm and Charles Farrell in an early episode of the popular 1950's sitcom. In this episode Margie agrees to go on a camping trip with her father hoping to trick him to take her to Hawaii. "Andy Plays Santa Claus" In the traditional Christmas episode, Andy works very hard to earn enough money to buy a doll for his godchild. "Amos Helps Out" After a domestic fight, the Kingfish writes a fake letter from the license bureau stating that he and Sapphire were never legally married. "Kingfish Gets Amnesia" The Kingfish gets amnesia when all of his friends come over asking him to repay old debts. "The Society Party" The Kingfish and Andy try to get their ladies to wear the same fur coat at the same time, to the same party. "Leroy Lends A Hand" The Kingfish and Andy go into the parking lot business and wind up in the used car business. "Call Lenigh 4-9900" The Kingfish accidentally answers a newspaper ad for a lonely hearts club, and when a girl shows up at his office, Andy poses as the Kingfish. "Kingfish's New Neighbors" While trying to get rid of neighbors who borrow everything the Kingfish uses the crying of a baby and a sound effects record, but the plan backfires as the Kingfish is about to be evicted. "Convention" In Chicago, the Kingfish gets a sample of the con game from his wife Sapphire who gets them to turn over their money to her, using a disguise, leaving the boys no money to get home. "Andy Learns To Fly" The Kingfish teaches Andy to fly, so that he can win back his girl from a motor boat enthusiast. HOWDY DOODY SHOW (1951) "Howdy Goes To School" In this classic kinescope, Buffalo Bob Smith and all the gang from Doodyville find out what Howdy likes best about school. BUICK BERLE SHOW (1953) "G.S.- Vic Damone, Jackie Cooper" Milton Berle does a spoof of "Dragnet" and Vic Damone sings "April in Portugal" in this delightful show. HOWDY DOODY SHOW (1948) "Howdy Doody For President" In one of the earliest episodes of the series, Howdy Doody decides to run for president in this very rare kinescope. RED SKELTON SHOW (1952) In this show Red proudly displays the Emmys his program won, does a pantomime routine, and a sketch that spoofs British newscasters. COLGATE COMEDY HOUR (1950) Abbott & Costello host this delightful half hour of comedy with guest stars Vera Zorina and Tony Bavaar. The boys do comedy skits and musical numbers. HOWDY DOODY SHOW (1955) "G.S.- Gabby Hayes" In this episode Buffalo Bob presents a new clubhouse and new cast members. Guest star Gabby Hayes comes to the clubhouse. JACK BENNY PROGRAM (1957) "G.S.- Jayne Mansfield" * Jack holds his annual talent competition to showcase the stars of tomorrow. Mel Blanc does a very funny segment as an animal impersonator and Jayne Mansfield comes on stage to reclaim her purse that Jack has taken. "The House Trailer Raffle" (Pilot) 9/15/59 * Stars Bob Sweeney and Cathy Lewis as Fibber McGee and Molly. In the pilot McGee is lured into buying a huge house trailer and tries to hide it from Molly. "Shooting Gallery" 9/22/59 * McGee gets the whole town angry at him when he rents his store to a man who uses it as a shooting gallery. "Good Neighbors" 9/29/59 * Fibber buys several goats to keep up his lawn. When he can't keep them under control the neighbors come calling. "The Big Dance" 10/6/59 * Fibber is in charge of the annual lodge dance and everyone thinks that he's going to mess it up. THE GREAT GILDERSLEEVE (1955) "One Too Many Secretaries" * Stars Willard Waterman as womanizer Throckmorton P. Gildersleeve in the television version of the popular radio series. In this episode Gildy hires his girlfriend as his secretary by mistake but doesn't want to fire his current secretary. HOW TO MARRY A MILLIONAIRE (1953) "It's A Dog's Life" * Stars Barbara Eden, Lori Nelson, and Merry Anders as three girls trying to find rich men. In this episode the girls take care of a lost dog that has a expensive collar hoping that the owner is a millionaire. MEET CORLIS ARCHER (1952) "Christmas Show" Stars Ann Baker as the unpredictable teenager Corlis Archer. In this episode Corlis desperately tries to find her hidden Christmas gifts. "Kleebob Game" (Pilot) 10/12/50 George Burns and Gracie Allen brought their comedy act to television in 1950. In this episode George and neighbor Harry Morton try to trick the girls out of going to the movies by teaching them the Kleebob card game. "Checking Account" 12/7/50 Gracie gets careless with her new checking account which George tries to balance. "Tax Audit" 3/1/51 The Income Tax Man spends a frustrating day trying to figure out Gracie's tax deductions. "Teenage Visit" 4/26/51 The Vanderlips daughter stays with George and Gracie and Gracie helps her with her homework and really confuses the poor girl. "Beverly Hills Uplifting Society" 10/11/51 The Uplifting Society is broke because Gracie has spent all of their money to buy a wall safe to put their money in. "Christmas" 12/20/51 Mamie Kelly and the kids visit George and Gracie for the holidays. Gracie reads her own delightful version of "A Christmas Carol" including other characters from other fairy tales. "Harry Morton Is Missing" 5/18/53 Gracie thinks that Harry was kidnapped after he doesn't come home for lunch. She hires a detective to find him and learns that he had lunch with a mysterious blonde woman (Blanche). "G.S.- Bing Crosby, George Burns" (1954) Jack is taking a day off from his show and he invites good friends Bing and George over for a golf game and to try to get them on his tv show. Bob Hope also has a cameo in this episode. "G.S.- Audrey Meadows" (1958) In this live kinescope from the show Audrey Meadows is the guest and she does "Honeymooners" sketch with Jack as Ralph Kramden and Dennis Day as Ed Norton. "The Whistler" (1954) * In this show Jack does a spoof of the radio series "The Whistler" and shares other memories of the good old days of radio. Mel Blanc and Dennis Day also appear. "Christmas Shopping" (1956) Jack does his tradional Christmas episode as he goes Christmas shopping and drives poor store clerk Mel Blanc nuts. One of the funniest episodes of the series. "New Year's Eve" (1956) Jack appears with the coaches from the 1956 Rose Bowl game and recreates his famous New Year's Eve radio sketch. "Train Station" (1956) *Jack has nothing but trouble in this episode when he goes to the train station trying to leave on a trip. "Surprise Party For Dennis" (1955) * Jack plans a surprise party for Dennis Day but Dennis finds out about it when he shows up at Jack's house to complain about next week's show. "G.S.- Edgar Bergen" (1958) * Jack goes to Edgar Bergen's house hoping to get him to guest star on his tv show and he meets Charlie McCarthy and Mortimer Snerd. "Jack Goes To Palm Springs" (1954) * Jack has a disastrous trip to Palm Springs after he jumps in a swimming pool that has no water and ends up in bed for the rest of the trip. JOE & MABLE (1954) "Joey Picks Up A Thief" Stars Larry Blyden and Nita Talbot in this very rare sitcom about a cab driver and his girlfriend. In this episode Joey unknowingly picks up a thief in his taxi and when he finds out who he was is afraid that he'll come after him. TOPPER (1953) "Vacation Contest" * Stars Leo G. Carroll as Cosmo Topper and Robert Sterling and Anne Jeffreys as George and Marion Kirby, Topper's ghostly friends. In this episode Topper's wife Henrietta enters a contest and George and Marion make sure that she wins. MOLLY (1953) "Old Friend's Fight" * Stars Gertrude Berg as Molly Goldberg in this series that would later be known as "The Goldbergs". In this episode Molly tries to fix the marriage of two friends that are fighting. THE GREAT GILDERSLEEVE (1959) "Dancing Lessons" * In this episode Gildy has Leroy take dance lessons and Gildy falls for the dance teacher and signs up for $600 worth of dance lessons. HOW TO MARRY A MILLIONAIRE (1953) "Penthouse" (Pilot) * In this pilot episode of the series, the girls try to find a way to afford their penthouse apartment so that they can attract millionaires. HOT OFF THE WIRE (1957) "Mike's Big Romance" * This series stars Jim Backus as Mike O'Toole, con man news editor of a small newspaper, and Nita Talbot is his assistant. In this episode Mike plays fiance to a rich heiress (Patricia Barry). QUICK AS A FLASH (1956) This game show was hosted by Bill Cullen. In this show the master of horror, Boris Karloff is the guest. MY LITTLE MARGIE (1954) "Vern The Hood" Margie tries to convince a banker that she's in debt to a hood (Vern) so that he'll give her money to help the neighbor lady by a new car. 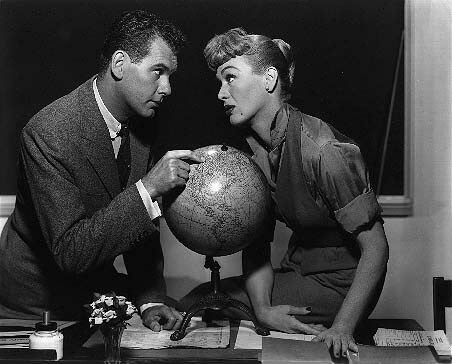 OUR MISS BROOKS (1952) "Pilot" * Stars Eve Arden as school teacher Connie Brooks. In the pilot show Miss Brooks tries to get Mr. Conklin to be romantic to her by trying to pick a fight with him so that they will kiss and make up. FIBBER McGEE & MOLLY (1959) "Rekindling The Romance" * In this episode Molly and her next door neighbor leave their husbands until they will become more romantic. "Come Back Little Junior" In 1953 William Bendix brought 'The Life of Riley" back to television and returned to the role of Chester Riley, which he made famous on radio. In this episode Riley's son Junior runs away from home after disagreeing with Riley. "Riley's Wild Oats" In this episode Riley tells wife Peg that he needs one night a week to do his own thing. The only problem is that he has absolutely no idea what to do. "Junior's Double Date" In this episode Junior tries to find a date to the school dance and thanks to Riley he ends up with two dates. "The Auction" In this episode Riley spends his bonus check on a old suitcase at a auction and finds that it is filled with stolen money. "Grandpa Meets Zsa Zsa" Bob Cummings stars in this series as womanizer photographer Bob Collins. In this episode guest star Zsa Zsa Gabor confuses grandpa for Bob , whom she thinks is wasting away. DRAGNET "The Big Boys" One of the most popular crime dramas in the 1950's focused around true police stories and starred Jack Webb as Sgt. Joe Friday and Ben Alexander as Officer Frank Smith. In this episode Sgt. Friday and Officer Smith set out to catch Army deserters on a robbery spree. Guest star Leonard Nimoy is featured in a early tv role. RACKET SQUAD "The System" * In this series true crime stories are reenacted to expose frauds and cons. In this episode a man and his beautiful daughter try to con a successful man out of his money by using a race horse scam. MR. & MRS. NORTH "The Million Dollar Coffin" * Stars Barbara Britton and Richard Denning as a man and wife detective team. In this episode Mr. and Mrs. North try to figure out why a man was murdered trying to dig up a grave until they find stolen money in the coffin. THE THIRD MAN "Dark Island" * Stars Michael Rennie in the tv version based on the radio series as undercover agent Harry Lime. In this episode Lime is brought to a strange island and held against his will. "The Rare Coin" (Pilot) In this rare kinescope of the pilot show, the television cast is introduced by Freeman Gosden and Charles Correll, the creators of Amos 'n' Andy. In this episode the Kingfish tries to swindle Andy out of a rare coin and Andy swindles it right back by use of a clever trick in a phone booth coin slot. "Kingfish Sells A Lot" The Kingfish decides to dispose of a worthless piece of property to Andy, but it's Andy who gets the last laugh. "Getting Momma Married Pt. 1" The Kingfish's mother-in- law elopes with a con man and a fleecer of widows. "Getting Momma Married Pt. 2" The Kingfish's mother-in- law is so set on marrying a man that even when his wife shows up she still says he is hers. RACKET SQUAD "The Christmas Caper" Reed Hadley and his detectives try to nab a gang of conniving con men who scheme against Santas. DRAGNET "The Big Girl" Carolyn Jones guest stars as a suspect in this story of a tall beautfiul girl who beats and robs over a dozen victims. BOSTON BLACKIE "The Boxer" In this episode Blackie investigates a scam involving a boxer who's matches are being fixed by his manager. MR. & MRS. NORTH "The Mysterious Doll" * In this episode some thieves try to get a doll that's full of jewels. ROY ROGERS SHOW (1952) "Land Outlaws" * Stars Roy Rogers, Dale Evans, and Pat Brady. In this episode Roy and Pat masquerade as crooks in order to catch real thieves that keep beating up land surveyors. RAMAR OF THE JUNGLE "Savage Fury" * Stars Ron Hall as Ramar, the protector of the jungle. In this episode Ramar tries to stop gun smugglers in the jungle. THE GREAT GILDERSLEEVE "The Whistling Bandit" * In this episode Summerfield is plagued by the mysterious Whistling Bandit. Gildy thinks that he will be a hero if he catches the Whistling Bandit so he goes undercover to find him but gets mistaken for the Whistling Bandit when trying to catch him. HOT OFF THE WIRE "The Missing Heir" * In this episode Mike tries to find the missing heir to a rich woman after she leaves all of her money to her cat. Ken Berry appears in one of his first tv appearances. "Groucho & The Marx Brothers" Various items from movies and tv with the Marx Brothers. "Gracie Trips On A Rug" 8/17/53 Gracie trips on a rug in a department store and they fear she'll sue and she's afraid that they'll sue her for putting a rip in their rug.